The nose is a popular area to get pierced, with three different areas available for piercing. 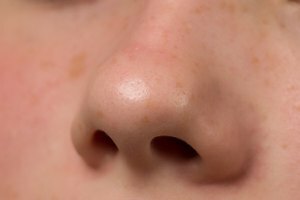 These areas are the nostril, the septum (the small cartilage area between your nostrils) or the bridge of your nose. 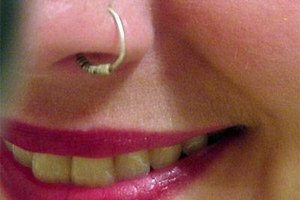 Of all of these piercings, the nostril is the quickest to heal and the one area you will be most likely to place a stud. Bending studs is not difficult if you have the right tool to do it, and you may be surprised to learn you have an adequate tool right in your garage or utility drawer. Choose a nose stud that has the most length on the end. This will make bending and fitting the stud to your nose easier. Place the needle nose pliers in the center of the nose stud shaft. Use your fingers, if you have strong hands and resilient fingers, or the other pair of needlenose pliers to squeeze each end of the nose stud simultaneously until it is bent enough for you. Pour some hydrogen peroxide into a small bowl or cup. Drop the nose stud in. Allow the hydrogen peroxide to fizzle and bubble, killing all of the germs and bacteria from the nose stud. Dry the nose stud completely and put it into the pierced hole in your nose. Adjust as needed with the needle nose pliers until you get a comfortable fit. 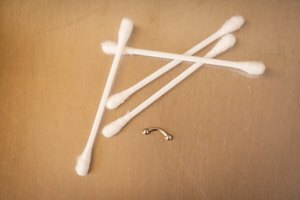 Remember to clean the nose stud before putting it back in your nose. You can buy jewelry needlenose pliers at craft stores and online. Exercise caution when using needle nose pliers and other sharp ended objects so that you do not stab yourself. Failure to clean the nose stud after using dirty pliers can result in infection.